After reading and watching helplessly the recent massacre of minority Burmese Muslims by the Buddhist majority, let not another hypocrite sing that phoney 'song' about Buddhists being "peaceful." 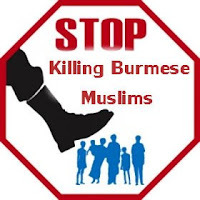 In June 2012, hundreds Burmese Muslims have been butchered, and many more injured and made homeless in Burma as a result of religious intolerance by the Buddhist majority. The Burmese military government, far from trying to resolve the problem and protect the minority, has been silently conniving with the rioters by creating greater hardships for the Muslim minority. The reason of this June 2012 riot is unknown except for the periodical outbursts of the Burmese Buddhists to show their might and vent their anger on the helpless minority. It is commonly accepted that the June 2012 massacre of Burmese Muslims was intentionally orchestrated by the rioters in collaboration with the government. Yet the world, including the UN, is conveniently silent. The brazenly hypocritical and unscrupulous woman, Aung San Suu Kyi, is very prompt at accusing the Burmese military of human rights violations when she is under house arrest. But she finds nothing wrong when the military helps the Buddhist mobs to murder the innocent Muslim minority of her country. As in India, anti-Muslim riots are nothing unusual in Burma. Violence in Burma against Muslims have been erupting periodically since the 1920s, based simply on religious intolerance by the Buddhist majority. The Muslims of Burma mainly belong to the Arakan state in western Burma. They are known as Rohingya or Burmese Muslims. The term "Rohingya" has been derived from the Arabic word "Raham" meaning sympathy. Muslim settlements began being established in the Arakan province of Burma since the arrival of the Arabs in the 8th century. Presently about 800,000 Rohingya live in Burma. The United Nations describes them as "one of the world’s most persecuted minorities." Yet it has never bothered to help them. Religious freedom for Muslims in Burma has been systematically curbed. In the post 9/11 era, random accusations of "terrorism" against Muslims have become a common form of persecution and harassment by Burmese Buddhists. Burmese Government does not consider Rohingya Muslims as citizens and they are hated by the Buddhist majority. Rohingya Muslims in Burma have long demanded recognition as an indigenous ethnic group with full citizenship by birthright. But the Government regards them as illegal immigrants from neighboring Bangladesh and denies them citizenship. "Nobel Prize winner," Aung San Suu Kyi, does not consider Muslims as citizens. Speaking at London School of Economics meeting on June 2012 during her visit to the UK, she said "Rohingya Muslims should not be considered citizens." Later during her press conference at Downing Street, she did not condemn the killings of Rohingya Muslims taking place in Burma. Instead, she simply said that this "ethnic conflict should be investigated and dealt with wisdom." It wasn't just an insufficient response but a very shocking one from someone supposed to have won a "Noble Peace Prize." The Dalai Lama, continues to globe trot without mentioning a single word of the dangerously growing Buddhist intolerance in Burma, Thailand, Tibet and across the world. Such intolerance and persecution invariably result in resistance by the oppressed. Many Muslims have joined armed resistance groups, fighting for greater freedom in Burma. On June 3rd 2012, eight Muslims returning to Rangoon in a bus after visiting a Masjid in the Arakan province were attacked by a mob of hundreds of Buddhists and slaughtered brutally. An eye-witness reported that after the mass murder "the culprits were celebrating triumph spitting and tossing wine and alcohol on the dead bodies lying on the road." "These innocent people have been killed like animals," said Abu Tahay, of the National Democratic Party for Development, which represents the country’s much-persecuted stateless Muslim Rohingya community. Thai government. In February 2009, a group of 5 boats packed with Burmese Rohingya Muslims were taken out and abandoned in the open sea by the Thai army. Four of these boats sank in a storm and one was washed ashore near the Indonesian islands. The few survivors who were rescued by Indonesian authorities told horrific stories of being captured and beaten by the Thai military and then abandoned at open sea. Being "peaceful" or "humble" (as claimed by their biased supporters) is a far cry concerning the Burmese Buddhists. Their vindictive temperament prowls for vendetta, waiting to use even the most insignificant occurrence as an excuse to perpetrate violence on Burmese Muslims. At any time, if there's some ethnic disturbance between Muslims and Buddhists/Hindus in any other country, the Burmese Buddhists waste no time going on a murderous spree killing the Muslim minority in Burma. If there is the slightest of trouble between Muslims and non-Muslims in Indonesia, it's taken as a pretext to kill Muslims in Burma by Buddhist mobs. The destruction of the statues in Bamiyan (Afghanistan), created an immediate excuse to commit violence against Muslims in Burma in 2001. The firebrand Buddhist monks demanded a Muslim masjid to be destroyed in retaliation. Mobs of Buddhists led by monks, vandalized Muslim-owned businesses and property in Burma, and attacked and killed Muslims in Muslim localities. Gruesome images of murdered Rohingya Muslims in the recent June 2012 riots in Burma have been circulated on websites, resulting in protests in several Muslim countries and by various human rights activists around the world demanding justice & protection in Burma for the minority, but has fallen on deaf ears as usual, getting little or no coverage from mainstream news channels. PLEASE SEND THIS AROUND. THE WORLD HAS THE RIGHT TO KNOW THE TRUTH.